ANAHEIM, Calif. – The Hawai’i basketball team fell into an early hole and could never climb out of it in a 71-60 loss to UC Irvine in the quarterfinals of the Big West Conference Tournament. A crowd of 3,942 at the Honda Center watched the Warriors drop to 17-14, including two losses to the Anteaters. UCI improved to 19-14, and will face top-seed Long Beach State in a semifinal game on Friday. Pacific and Cal Poly will meet in the other semifinal game. All four of the top seeds advanced through the quarterfinals. Hawai’i, which was the No. 5 seed for the tournament, is considered a very long shot to receive an invitation to a postseason tournament. The Warriors trailed by as many as 23 points in the first half, and could never get closer than 10 in the second half. Seniors Hauns Brereton and Vander Joaquim each scored 18 points to lead the Warriors. Brereton also grabbed a team-high nine rebounds, while Joaquim got six. Christian Standhardinger added with 11 points and eight rebounds. The Warriors shot just 34.9 percent from the field, including 22.2 percent (4 for 18) from 3-point range. UCI shot 40.4 percent, and out-rebounded the Warriors 40-38. The Anteaters raced to a 24-5 lead to open the game, and it was never close after that. UCI took a 44-22 lead at intermission, with Will Davis II scoring 13 in the first half. The Anteaters shot an efficient 14 for 24 from the field (58.3 percent) and 12 for 14 on free throws (85.7 percent) in the first half, and out-rebounded the Warriors 22-15. Hawai’i shot 26.5 percent from the field (9 for 34) and went just 1 for 3 on free throws. The Warriors opened the second half with an 11-0 run to cut the UCI lead to 44-33 with 16:45 remaining. Hawai’i got as close as 10 at 46-36, but the Anteaters responded with a 5-0 surge to push their lead up to 51-36 with 12:45 remaining. More details will be posted later, including video highlights and interviews. we are just a big slow team with unathletic players…. There you have it – lost to UCI [17 – 14 ] ; subpar performance, even worst result, womp, womp! Enjoy Disneyland – this season is over, start workouts and more broken promises next week. Mahalo Warriors . . . . . until next Fall. P.S. In this league – 3 Games over .500 is a C- grade, I’m just saying . . . . read between the lines! I’m glad the guys fought back, but it was a disappointing way to end the year. It’s nearly impossible to fight back from a 20+ point deficit, which happened two years straight. For some reason, Coach is unable to get the team fired-up out the gate. It was certainly a disappointing season overall to say the least. I hope we can keep our personnel departures to a minimum this time around. Looking ahead to next year, Coach needs to recruit a difference maker or two this off-season, because the Big West is going to be even tougher next year (with so many key players around the league returning). It is an end of a very disappointing season. And the winning record belies the whole truth. Their schedule according to the RPI was weak. In comparison, the Wahine’s RPI was very good, 109 because they played a tough non-conference schedule. Irvine was smart, they packed it in because they knew Hawaii was going to try to get the ball in the paint. Hauns had 18 points, but was only 2 of 8 from 3 pt. line. Fotu couldn’t get going. Tavita was 0-5 and and air ball. Vander tried, but got blocked a couple of times too. Manroop came off the bench and gave the team a spark with 2 3 pointers, one a bank shot! He scored 8 points and did not turn the ball over in 22 minutes and has 2 assits too. I thought the team should have tried to get him more shots because he’s the type of guy who can get off if he’s on. Manroop is growing a beard it seems so maybe he’s trying to play and look like James Harden. Hehe! We will have better shooters next year I believe. Five words: CAN’T WAIT FOR KEITH SHAMBURGER! Glad they fought back to within ten. In first half, with Irvine’s great D, and them being super physical with Vander, Christian and Fotu, once UH got down 11-12 points, I thought , sad, but game over. When Irvine increased lead to 20 , very hard for UH even if they had Spearman to come back and win. Sure, I guess we all have opinions. Some on this forum, very few, that know the talent level drop off of a low mid major is so huge, when you 3 of your starter are injured at some point during season, it is hard to finish strong. If Vander, Jace and finally the last dagger Spearman, especially Spearman, the main Cog in the UH MBB team. When Brandon went down in the Pacific game, Dallan, and others, that was the end of UH’s season in regards to any BWC tournament title and any secondary post season tourney, i.e. CBI or CIT, or whatever else is out there. Same with WBB, they ran into a team that was on a mission, Fullerton, and not to be denied. Bottom line, it is Gib’s team , and he will take full responsibility for finishing with a winning record in conference, overall regular season at 17-14, however, nothing he could do to stop Irvine being such a great Defensive team, and he not having Spearman, and for sure, the type of athletes, like the PG Young, co Freshman of the year, John Wilder, And Wil Davis. an athletic sky walker. I give Irvine the shot to win the Big West tourney and go to NCAA’s. Dallan: sir, what is the answer? New Coach, or Coach recruit better athletes? Dayton, you have run a great site, since Nash’s tenure, the best Insider Source for all things to do with UH Warrior MBB, thank you and Mahalo to you and your great staff. To the Schmidts, and Ameriprise Financial. Now we UH MBB fans have to wait till the NCAA summer league starts in a few months to see Aaron Valdes, Michael Thomas, Keith Shamburger, Stefan Jovanovic, and possibly another PG or SF! Well Gib after 3 seasons has 52 wins=average 17.3 wins per season, one post season invite . Hopefully, Caleb Dressler, Stefan Jovanovic, Aaron Valdes, Michael Thomas, Keith Shamburger, Dyrbe Enos, and returnees can step up and equal or bypass BW teams next year. Maybe some movement, we shall see, still think Gib has to bring in a super JC PG, and another very good athletic 6’8″ SF who can sky , score,, defend, block shots and run like a deer, like Wil Davis II!! I think Gib is out recruiting at this very moment. Hey Fans,what is the Answer: I guess wait till this Oct 14 2013 to see who is on roster for 2013-14 MBB team. I am sure it will be more athletic. Kudos to the great Character, and sportsmanship, really nice kids, in Vander, Hauns and Jace, have great post UH careers, aloha and thank you for your hard work! Mahalo to Ozi, Aussie Mums, TribeV, Tonganator, Chicago, Memphis, and all points around the globe of Warrior(Rainbow for old timers)Men’s Basketball. Darn, darn darn!! 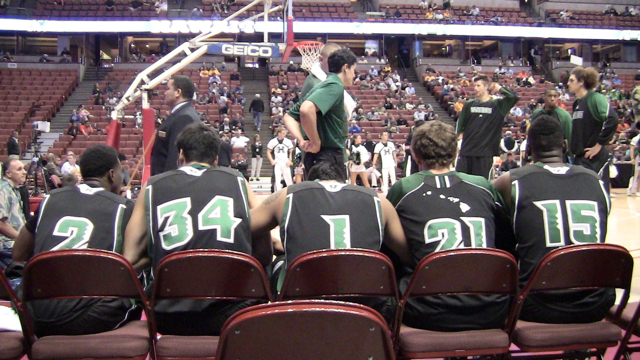 UH from tip off could not compete with athletes from Irvine, 22 pts down at half, very hard to make a run. Well see what coach recruits, and whether, returnees, like Manroop, Ozren, Jefferson, Jawato, can they step up along with new guys? Shoots!.. darn, darn, darn! Well, at least there is UH Wahine softball, and maybe UH MVB team gets to MPSF tournament, Men Baseball, ? darn, darn, darn! Too bad! Coach Gib now what? Good second half effort though, I guess, we love team so much, and seeing, they have hard time competing with BW talent with WAC type players, hard to bear. shoots, wait till next season!! Will Davis is a center, not an SF. he’s also a role player that periodically has big games. we need more than that. he’s a poor man’s Bill Amis at best. Good luck to the Warriors in the next season, I hope it will be better. Ozi Mum Ankica Pavlovic, you have a terrific son. He is very gregarious,a fun loving guy, team loves him. The wizard of Oz, hope he stays for summer school, works on weights and get stronger, he still has potential to be a very smart and deep 3 ball shooting wing player. Thank you for letting Ozi come here to play. I am sure he misses home, however the coaches , team and fans took him in as family. In fact he looks ten pounds heavier since last fall! You and Aussie Mun are great supporters of your sons BB carrers though so far away. Best wishes to you, and if you have another 6’10 230 pound athletic son, who wants to play DI ball in the USA , tell Gib! Aussie Mum: Man oh Man, I wanted UH to kick Irvine’s Arses too! However Irvine played very well, they are one of the best defensive teams in the nation. Aussie, Tim Tam , Mum, you love Mike and he loves your too, you and your mister and family at great sacrifice helped to make Michaels’s dream of playing NCAA DI Basketball a reality. He is a great young man, movie star looks, great sense of humor, good student, and great with young kids, encouraging them and mentoring them. He is a first class UH Warrior MBB athlete. Wish he were my son. Gib did a great job: PRIORITY ONE for this year, to make up for loss of 4 guys who left program recruit good kids, and he did, Ozren, Michael(a great walkon), Aaron Valdes, Caleb Dressler, Keith Shamburger(RS JR transfer, Dyrbe Enos(a RS from Kapalama Kamehameha schools Honolulu), Brando Spearman, and Manroop Clair, The guys are friends, real Ohana, they are down, so give Michael a call and some Tim Tams, maybe that will make them work harder during the summer and next year have that 25-5 regular overall season record and BWC record of 15-1, and BWC tournmanent victory and go to NCAA tournament at 28-5 and ranked number 24 in the nation, gong up against Washington St. in the first round. !! Yeah with good recruiting, and movement, and the guys just getting faster, and more athletic, and knowing the OFFENSE Gib wants to run, and having the PG to run it, UH will be fine, I wish it were Nov 2013 already and the first game of the 2013-14 season! Go Warriors, and we send all of our aloha and love to the Harpers, the thunder from down under, first class Aussies and super people with a fantastic good natured boy in Michale Harper!! Uhfanzonly1 says thankyou Mahlao, you have always been supportive and nice on this forum, except when you want the team to play tougher, Australian rules football on the BB court, would have won UH 30 games for sure!! Kick Arse!! Thanks Aussie Mum, fun, reading your posts! Read your comments next season, Aloha, UHF! 😀 !! You always put a big smile on my face when I read your posts. I didn’t get to see the game today – first one that I have missed! I can’t comment on the game and I dont’ have all the history of the team – but it seems to me that everyone including the coaches and staff will be re-examining the year – looking for new recruits etc. Any guy that gets an opportunity to play for the team should be very proud indeed – it is a very special place with very special people there. I am sure that Gib, the coaches and players will not give up – as I am sure the fans won’t as well. It seems to me that we just need to get a few more smarts about us – this conference seems to be a smart players conference that play fast and plenty of shooters from all positions available anytime. Love to Dayton for an awesome year, the Schmidts for their continued support and generosity and to all my UHMBB fellow posters who keep me connected with all things UHMBB – it is really special to us Down Under. Dallan and UHFA: as I posted or maybe UHF, that kid John Wilder had a double double 12 pts and 10 rebounds. he was a huge difference in the game, a senior, not very athletic, however very BB smart. In all 3 games, if UH shut down Wilder , UH wins game, no one could hold him to 5 pts and 4 rebounds. they shut him down, UH wins, simple as that. Wilder the X factor, every team needs that one catalyst! Darn John Wilder, now I hope they beat the Beach, or some fans, we don’t care, wait for Gib hopefully to sign another JC PG and possibly an athletic PF who can sky and rebound, defend , run like a gazelle and score. Then UH will be competitive, the guard crew will be quicker next year, and with Thomas, Valdes, the Super Athletic SF(I am just dreaming hopefully not!!) and the super JC to play 3 years PG who can score from 3, FT line and take to whold, and run defense, get steals and run breaks, I think with addition of two athletic players in addition to the recent signees and returnees, it is up to Gib to coach em well, if not, well next up after 2013-14. Maybe a Croattian, or Aussie Coach who became a USA student and graduated from USA COLLEGE!! Props to the team for bouncing back in the second half, particularly with that 11-0 run to start. Realistically, though, falling behind 44-22 was too deep a hole for most teams to dig their way out. Disappointing they couldn’t win a game or two in the tournament, but what’s done is done. What I particularly liked about this year’s team was its character and cohesiveness. They seem to be good kids who genuinely liked one another. There didn’t appear to be any of the drama that came with last year’s bunch, and credit should go to the parents who frequent this board. As for next year — unless Rozitis graduates and forgoes his senior season, or some others move on — the recruiting is done because all 13 scholarships are accounted for with the early signing of the 6-10 post player and the 6-6 wing. I think next year’s team has the potential to exceed this year’s squad, particularly in Big West play because overall team speed and quickness will be improved. I didn’t really like the “big” lineup — particularly for conference play. That’s why Spearman’s injury came at the worst time as the team was settling into a nice rotation with Fotu coming off the bench,, along with Jawato, Jefferson and Rozitis. Someone will need to push Shamburger at the point and Clair clearly is more comfortable as a supporting guard rather than being the primary ballhandler. I thought Jefferson came a long way, moving from the 2-guard; maybe it’ll be him or Dyrbe. Did you see the guns on Enos? He didn’t look like that at Kamehameha. He should take Fotu and Standhardinger to the weight room. So the season’s pau. It’ll be interesting to see who’s put in the hard work during the offseason once the summer league rolls around. Again, thank you to the Schmidt ohana for their support of this web site, and also to Dayton for his tireless efforts.